Wonderfully nice job! What are the spec's on your glass and lam thickness/tapers? marc, honestly i dont know. theyre whatever binghams sent. im saving up to get a drum snader so i can do my own lams. im pretty sure its .050 glass. but thats about all i know. save a tree... shoot a buck. I must say that you have done a fine job on that level of project, especially with the multiple lam's and overlays! Did you tell Binghams you were shortening the riser before they sent the lam's? Looking good, nice work. Bue--. i told them i was making the bow 62" and it had a 16" riser and they figured it all out for me. That's an excellant job TJ! Bow turned out really nice! I bet your mom will love it! Thanks for sharing! Wow, pretty cool! Turned out a very nice bow! Your mom is lucky! While I haven't made a bow this way before, I've always had a question: Where does the formica strip come into the bowmaking process? it came out 45#@28 and about 35-37 at her draw. 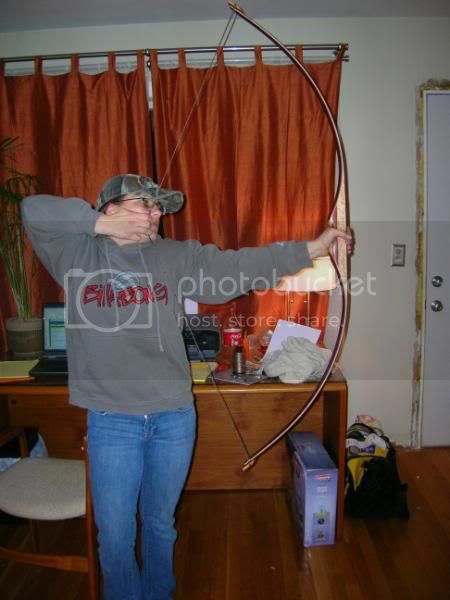 heres mom at full draw, this was before she had shot it and fixed a bunch of form issues lol. the formica strip helps get rid of the little imperfections on the form so the back of your bow doesnt get those imperfections glued into it. ie bumps and dents. it also helps keep glue off the form and such. what where thickness of your lams and glass? Great looking bow! Nice buildalong, very informative.